Being both an interior designer and an artist gives me the advantage of seeing things from both points of view. It is not just the artistic expression, but the understanding of space as a whole and the creation of artwork as an integral part of that space which makes the final result exceptional. In my work as an interior designer I search worldwide for unique products and materials, always seeking to push the boundaries, but have always found great difficulty in sourcing original and affordable modern sculpture. This is especially the case for large scale works. There are manufacturers, but the products tend to be very expensive, largely due to the use of expensive materials such as stone and metal. This gap in the market for large scale sculptures at affordable prices inspired me to develop my own range. I first needed to find a versatile material which could be worked without any special equipment, was reasonably priced and could be finished in a variety of interesting ways to make each piece truly special. Next, I had to address the logistical issues associated with transporting large works of art over long distances because I didn’t want to create sculptures which would require a team of twenty people and a crane to install. Following a lot of research, I finally decided on a material which surprised many people - high density polystyrene. Often used in construction, it is strong, light and easily manipulated. For my first piece I started with two blocks standing 2 metres high. I chose a design which combined a bold architectural structure with softer organic shapes - simple yet striking. My method of working evolved over the life of the project. After carving the details, the surfaces were sealed and then re-enforcement was applied to create a stable platform for the various different finishes. I combined slate metallic nickel tiles on parts of the sculpture and render on others. 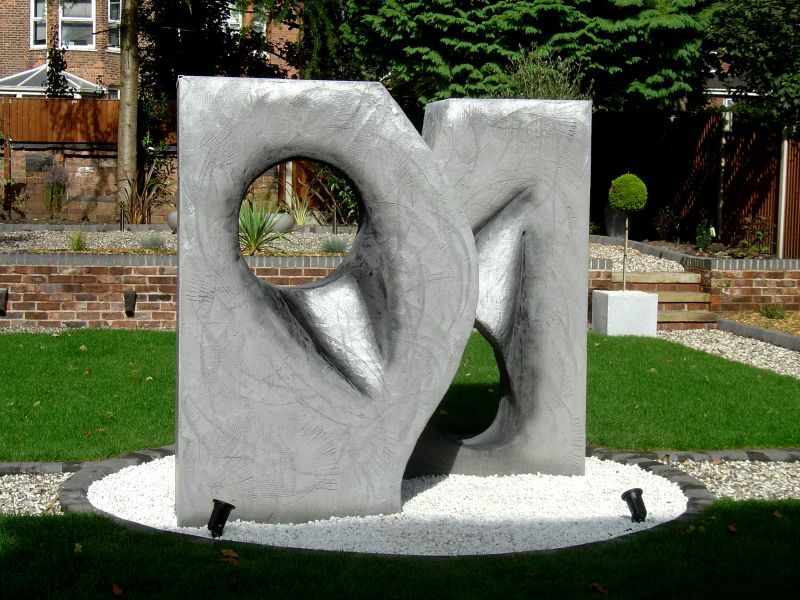 Pigment was carefully added to the render so that the finish resembled stone and this stone effect was enhanced by addition of textured pattern on parts of the sculpture. As a finishing touch, fine details of the design were highlighted with a layer of black and silver paint. Installation was simple. The combination of a shallow cement bed and a couple of metal rods secured it on the ground in no time at all. The result was impressive. The size and finish made it imposing but the design adds lightness and allows the sculpture to integrate with the surrounding environment effortlessly. Everyone who has viewed the installation assumed it was made out of stone, even after close inspection. The good news is that the cost does not reflect the appearance, even as a one-off piece. If multiple sculptures were produced as a limited edition, the cost would drop further. The versatility of the material makes it possible to produce a wide range of designs with many finishes and colours. The possibilities are endless! Such sculptures are not limited to the outdoor space. They could be used as part of any interior scheme for a WOW factor.